Planted late Sunday near a young African Spear Lily, Doryanthes palmeri, and gently settled into the garden by rain Monday night — life is occasionally capable of such sublime, perfectly timed moments. Other silver-leaved plants in the garden this year include 2017 holdover, slightly scraggly Hazardia detonsa, three of the compact form of California buckwheat Eriogonum giganteum, two Salvia pachyphylla, the Senecio palmeri from Santa Barbara Botanic Garden. And that’s not even counting the silvery succulents and greyish lavenders, including the very white ‘Silver Anouk’ lavender. This could all result in a drearily grey, covered-in-volcanic-ash effect come summer or the realization of a textural, intoxicatingly aromatic, light-refracting slice of heaven, able to handle the worst of summer’s heat and drought. 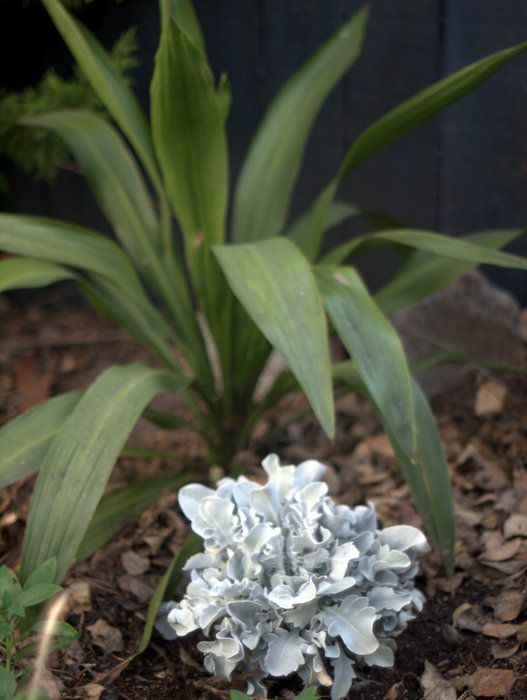 All silver-leaved plants, with rare exceptions (the New Zealander celmisias, unfortunately) are capable of a luminous performance in summer gardens precisely because of their leaves’ reflective adaptations to hot, harsh summer conditions. And in any case, it may not be up to me to decide whether I like a garden heavily weighted in silver. Many of these are notoriously touchy and prone to die-off, and the eriogonum even in a compact form may overwhelm this small garden. Still, even though there’s a good chance of failure, aren’t the possibilities exciting? 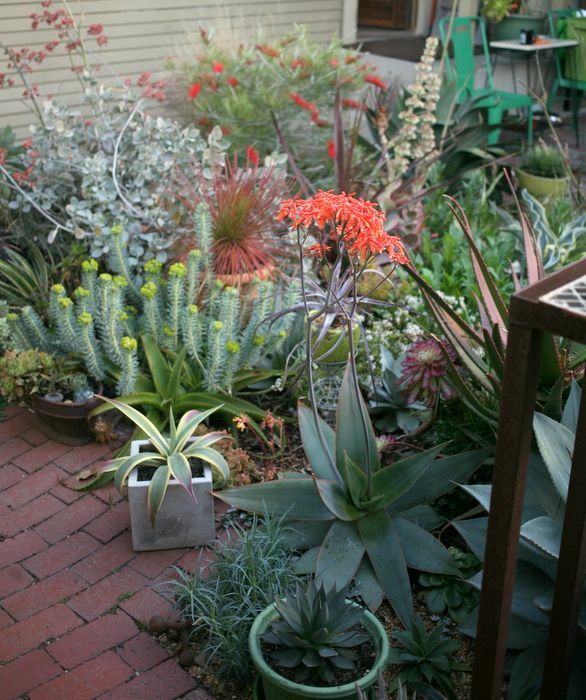 Aloe striata and Euphorbia rigida, with Grevillea ‘King’s Fire’ in bloom in the background. Note the cold-induced blush of pink on the tips of the leaves of potted Agave weberi ‘Arizona Star.’ The blue grassy leaves next to the potted Agave ‘Burnt Burgundy’ ‘Blue Ember’ belong to a dark maroon, single carnation, Dianthus caryophyllus ‘Single Black.’ So excited to see this in bloom for the first time this summer, knock wood. It may flop and sprawl, beg for lots more water than I’m willing to give, or look bizarrely out of place among succulents, but at this moment the potential of tall, merlot-red blooms floating over blue-leaved succulents is pure excitement. And scented to boot. And further back the tawny blooms of Bocconia frutescens, shown here in bud back in December. This shrub is now 9 feet tall and due for a cutback in spring. With the two clumps of pennisetum cut down at the base of the urn, the strong shapes of agaves and yuccas once again come to the fore. 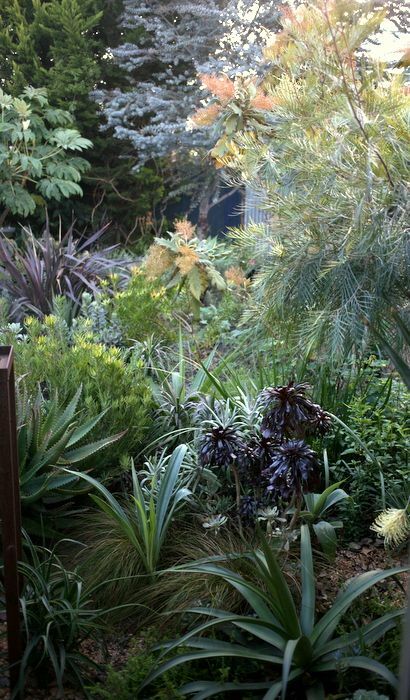 Zig-zagging from Yucca ‘Bright Star’ in the foreground, then on the left Agave ‘Ivory Curls,’ jogging to the right again with Agave mitis var. albidior, and in the distance Agave salmiana var. ferox ‘Medio Picta.’ There’s a couple pale yucca in there too, Yucca pallida, two remaining of three originally planted. Planted among these agaves for summer are calamints, now showing new growth after the winter cutback, which will keep the bees busy all summer and still keep things light and airy with good air flow and strong light penetration. Just out of sight behind the urn are the two Salvia pachyphylla and brittlebush/hazardia. The Mojave sage has a forbidding reputation for being difficult in garden conditions, but some beautiful specimens turned up locally, so now I can find out for myself. Some Argemone mexicana sown directly in the garden are germinating here too. That great silver for shade, Plectranthus argentatus, was slipped into a pot growing some cuttings of Sedum dendroideum and Senecio serpens. 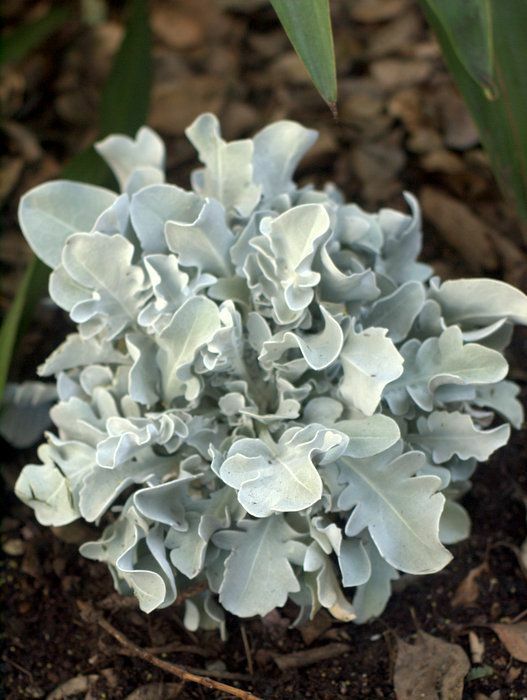 The senecio, instead of its normally dense habit of growth, elongated in the shade but kept its chalky blue color, spilling out like water. Plant abuse can produce interesting results. Kalanchoe schizophylla temporarily sits on the spindle until I get around to hanging the pot. Squeezed by Melianthus ‘Purple Haze’ all summer but still managing to quietly gain size are a couple of hybrid aloes moved from the front garden a couple years ago. 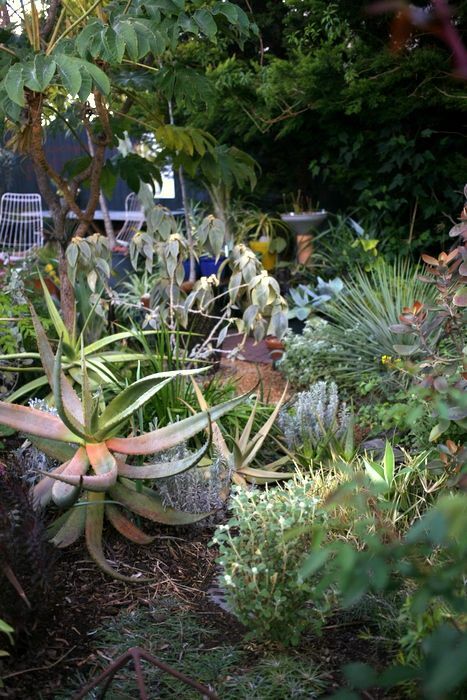 I think the aloe in the foreground is a ferox hybrid; hopefully, it will bloom next winter and clue me in on its identity. It’s forming a nice, solid trunk and should soar over the surrounding plants in another year in this dry jungle under the tetrapanax canopy. The melianthus was relocated near the bocconia to escape full afternoon summer sun, and now the aloes own this little patch and have really gained size. There’s a big clump of Anigozanthos ‘Tequila Sunrise’ here, several phlomis, ballota and the two Lavandula ‘Silver Anouk. I’m hoping it all knits together beautifully in a couple months, spiky rosettes among smallish, silver-leaved shrubs. And that’s my record of silvers thus far in the garden for 2018 — always subject to change. 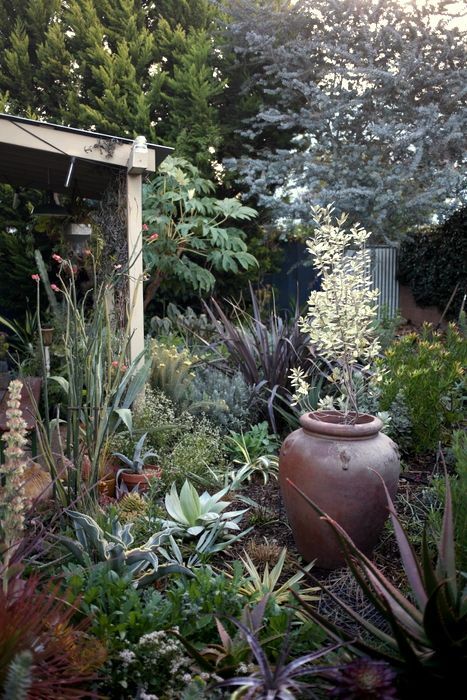 This entry was posted in agaves, woody lilies, journal, plant crushes and tagged Agave celsii, Agave mitis var. albidior, Agave salmiana var. ferox 'Medio Picta', Bocconia frutescens, Centaurea ragusina, Dianthus caryophyllus 'Single Black', dry garden, Eriogonum giganteum var. compactum, Ficus afghanistanica 'Silver Lyre', Hazardia detonsa, Lavandula 'Silver Anouk', Plectranthus argentatus, Salvia pachyphylla, silver leaves. Bookmark the permalink. You have a garden of wonders, Denise. I continue to be in awe of your ability to ferret out the relatively unusual or unknown everywhere you shop. I’m hoping that M. ‘Purple Haze ‘ will be found somewhere on my Socal sojourn. I have tried to find it in vain up here. My number one silver want remains Crambe maritima, which as also eluded me , though I think I can order it from Far Reaches and am also told by Cynthia W. that it grows easily from seed. I love pic 6, with it’s varied tapestry of form and color . Beautiful pictures! 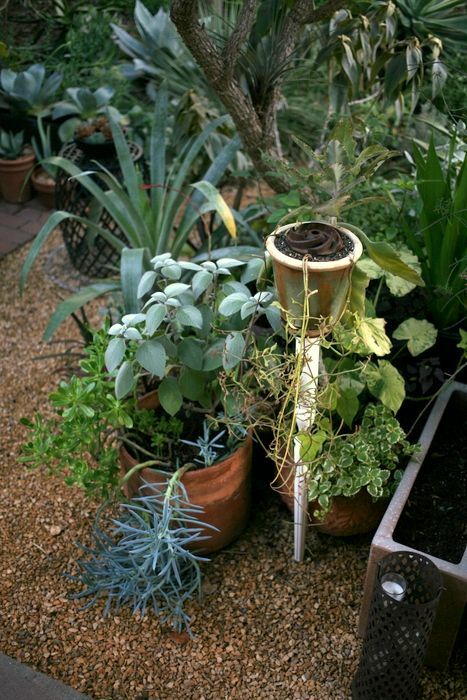 In third photo, what is the spiky thing with orange tips behind the euphorbia rigida? Thanks for sharing your garden! @Kris, as much local plant browsing as we do, it’s so nice to still be surprised every once in a while. Hope you had a good shopping trip on the Central Coast! @Kathy, that one is not easy to find. I’ll ask Dustin. And when I think of all the years I grew that crambe, finally pulling it up last year. It was getting too much shade under a grevillea and losing the blue color, plus it never bloomed for me. I bet it would bloom great in your zone. I’ll keep an eye out for shoots for you. @Rachel, I think you’re referring to a potted Agave geminiflora. It already had pretty good color from summer heat, and now this cold snap has really deepened the color. Thanks for stopping by! I’m known silveraholic so I think you are doing the right thing. 🙂 I love that Centaurea. 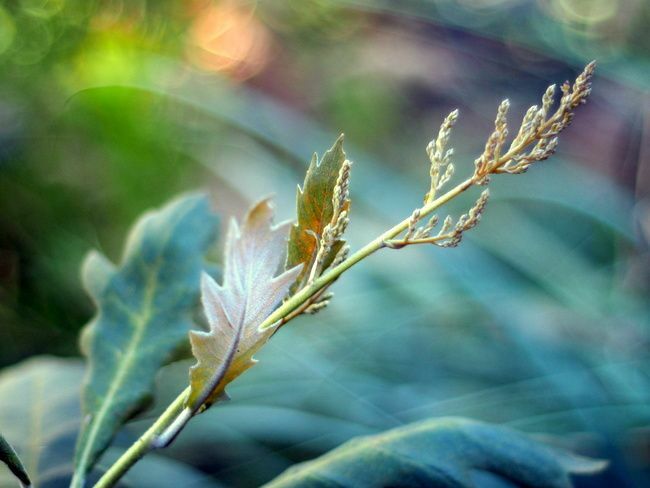 Your garden looks great, ever changing–that’s the stuff! Thanks for the name, Agave geminiflora. I bought one called Agave stricta rubra “Red Hedgehog Agave” from Annie’s Annuals. It isn’t red at all, even though I never water it and keep it in sun. Oh well!! Yours is very pretty.